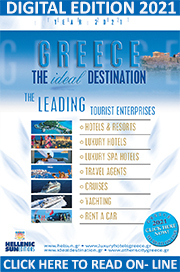 IdealDestination.gr provides you with handy information about Greece and its extensive tourism potential. The site allows you to contact the best hotels and travel agencies, the best cruise yachting and car rental companies alternative tourism and all other tourism-related enterprises whose primary concern is to provide high-quality services and unparallel hospitality. Easily accessed by air, boat, train or car, Greece is a crossroads between East and West. In addition to major airports in Athens and Thessaloniki, the country has over 40 provincial airports in most major towns and islands. The national railway network connects Greece with the rest of Europe; the in Patra and Igoumenitsa serve ferries arriving mostly from Italy. A very well organized and modernized intercity-bus network provides fast and safe transportation between most towns and villages in mainland Greece. Transportation between towns and villages is served by a modern bus network running on a 24-schedule. A large part of mainland Greece is also served by a railroad network that is continuously upgraded. Modern ports throughout the country connect mainland Greece with Crete and the islands in the Aegean and the Ionian Seas. Luxury and A category hotels and resorts in Greece offer high quality services and can be compared to the best hotels in the world. Hotel groups, hotels and resorts and city hotels in Greece (Athens, Halkidiki, the Greek islands, etc.) are constantly renovated to meet the international quality standards and are located in enchanting areas providing tourists unique holidays. Make your reservations through our web site in the best luxury hotel groups, hotels and resorts in Greece and make your visit a unique travel experience! Using rental cars in Greece is an easy way to travel and explore the country at your own leisure and convenience whether you are on a self-drive holiday, a family vacation or a business trip. If you want to see as much of Greece as possible, rent a car and get around is an ideal touring option. You can learn more about the interesting culture, exciting history, diverse landscape, iconic landmarks and hospitable people of Greece, at your own pace in your own style. The different areas offer a spectacular mix of beach driving and rocky slopes, stunning coastlines, spectacular snowy mountains, great waterways, amazing scenery and many must-see destinations for a drive holiday. Greece, one of the world's most attractive summer destinations, is an idyllic place for cruises, as it comprises a peninsula surrounded by 6,000 islands and islets scattered in the Aegean and Ionian Seas, combined with an ideal climate allowing for pleasant sea-travel conditions all year round. Cruises in the Greek islands offer visitors the opportunity to explore 7,500 km of the country's coastline featuring a highly diversified landscape made of golden stretches of magnificent beaches, shelter bays and coves, volcanic soil, sea-side caves with steep rocks and coastal wetlands.